I wanted to do this for quite some time, a remote control application for XBMC. Although the original XBMC Control application was doing pretty much what I wanted, the screenshot image was too small to read. So I decided to write my own and learn a bit of C# in the process... It's not doing too much, I've implemented a minimum set of keys and it allows for a good quality screenshot - in fact the image is captured at the XBMC TV resolution and then it's resized by the .Net PictureBox control to fit in the client app window. Planning to implement all commands on the remote control and the game controller, maybe even to execute a set of a batch of commands (as in Select all & Copy when in the File Manager), anyways we'll see how it goes. Download from here. Let me know if you find it useful or if you have any suggestions. Since writing the post, XBMC4Xbox split from the main XBMC project and the app continued to change, but I only tested it with XBMC4Xbox. Might just work with XBMC, the HTTP API shouldn’t be much different really. excellent work. this is just what i've been loooking for. my xbox is all the way at the other end of the house to my desk and this is allowing me to monitor my library updates while i get on with other things. I had one issue with the xbox playback freaking out every update interval. I can't use auto update while playback is running but that's no real drama. This was just a test app I wrote at the time, I haven't made any enhancements since. I know there is a few out there for Windows, I just can't seem to find them - maybe ask on xbmc.org forums. If you still can't find one that suits your needs, I might make the sources available or maybe even continue the development, just let me know what you would like to see it doing more. I think you performed a great service creating this win app. I am in the same situation as Stegg. I fully understand how to use the web version, but I would like to see how far you can take this. When installing scripts/plugins I used your app to test functionality until i moved it to the opposite side of the house and downstairs. it's behind a laptop's Nic/wireless bridge and xbmc remote wont work with it. 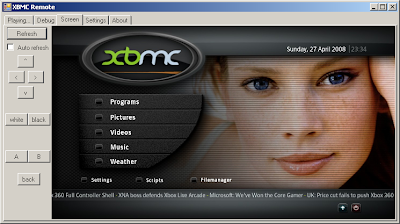 Are you aware of any apps that will run on xbmc to allow remote desktop users to control xbmc. I use mstsc from the command line everyday at work and would like to see some functionality with that winapp. Thanks, appreciate it. Taking screenshots was broken in latest versions of XBMC, it was fixed recently with Arnova's help, if you want to update to latest SVN builds. I made a few small changes, planning to implement next more of the controler / remote controll keys, but I don't know when exactly. I'm not aware of any RDP or VNC servers of that sort no.